One shooter is dead after opening fire Monday morning at the Washington Navy Yard, and Metropolitan Police Chief Cathy Lanier announced Monday night that authorities believe he was the sole person responsible for the shooting. Thirteen people were killed, including the shooter, Mayor Vincent Gray announced at a late afternoon press conference. No motive is known at this time. "It doesn't get much more serious than this," Gray said. Multiple news outlets identified Aaron Alexis, 34, as the deceased shooter. Originally of Fort Worth, Texas, Alexis recently began working at the Navy yard as a civilian contractor, NBC reports. At approximately 2:45 p.m., DC police announced over Twitter that one of two possible additional suspects, a white male in a tan outfit, had been identified and "is not a suspect or person of interest." Officials said a suspect began shooting inside the Naval Sea Systems Command Headquarters building at 8:20 a.m. Approximately 3,000 people work in the building. A "shelter in place" order was issued for Navy Yard personnel. At least six schools were on lockdown as a precaution in the D.C. area, according to CNN. Speaking with reporters, Navy Commander and witness Tim Jirus said he saw a man get shot in the head right in front of him. "We were standing in the alley," Jirus said. "[The victim] told me there was a shooter in our building... I heard two more gunshots and he went down while I was talking to him." Jirus then fled the area. He said he didn't get a look at the shooter. SWAT crews as well as police from multiple local and federal agencies are on the scene. President Obama has been briefed "several times" about the shooting, Fox News reports. Monday night, police confirmed the names of 7 people killed in the shooting. At a 10:15 p.m. press conference, Mayor Vince Gray stated that the deceased victims ranged in age from 46 to 73 and all were civilians or contractors, not military personnel. This is a breaking news story. Check back for more details. When 13 people died in a shooting rampage at the Washington Navy Yard on Monday, the story made front page news. But many of the mass shootings that have happened since the December massacre of elementary school students and teachers in Newtown, Conn., didn't. Michael Slocum, an attorney for a Virginia gun store, said in an email that Aaron Alexis visited Sharpshooters Small Arms Range on Sunday. He says Alexis rented a rifle, bought bullets and used the range. He then bought a shotgun and 24 shells. WASHINGTON -- Alleged Navy Yard shooter Aaron Alexis acted alone and was "determined to kill as many people as possible," law enforcement officials said Tuesday. Officials would not comment on Alexis' alleged motive during a press conference held Tuesday afternoon outside the FBI's Washington Field Office, but said they had determined he arrived in the area around Aug. 25 and had been staying at the Residence Inn in Southwest Washington, D.C. since Sept. 7. The FBI is investigating "hundreds" of tips they have received Monday's shooting. "No piece of information is too small," said FBI Assistant Director in Charge Valerie Parlave, asking for additional assistance from the public. Metropolitan Police Officer Scott Williams is doing well and is expected to make a full recovery, according to MPD Chief Cathy Lanier. "We have a very good prognosis from the doctors, he does have serious injuries to his legs. Again, I know the officer and I know his personality, and I'm real confident he will not only walk again but probably will outrun most of us again," Lanier said. Aaron Alexis entered Building 197 with only a shotgun in his possession, not an assault rifle like some media outlets reported. "We have no information that [Alexis] had an AR-15 assault rifle in his possession," the FBI's Valerie Parlave said in a press conference. "He may have gained access to a handgun ... and after he began shooting." Alexis was honorably discharged from the Navy in 2011 after bouts of insubordination, disorderly conduct and being absent from work without authorization. Officials said the bad conduct was enough to make it clear Alexis would not be a good sailor, but not enough to warrant a general or less-than-honorable discharge. They also did not involve criminal offenses, so did not trigger any court-martial proceedings. Suspected gunman Aaron Alexis, 34, died as well. Dr. Janis Orlowski, chief medical officer at MedStar Washington Hospital Center, told the Associated Press that three victims in yesterday's shooting -- including a police officer who was shot in the legs -- are recovering and in fair or good condition. She said two women who saw others shot are "very worried about their co-workers," but are unaware of the extent of the shooting. Schools near Navy Yard that were on lockdown after Monday's shooting have reopened on Tuesday, WJLA reports. "How immune are we becoming to these senseless mass shootings?" Eddie Weingart, the vigil's organizer and the founder of Project End Gun Violence, asked the ceremony's participants, who were flanked by twice as many media members. 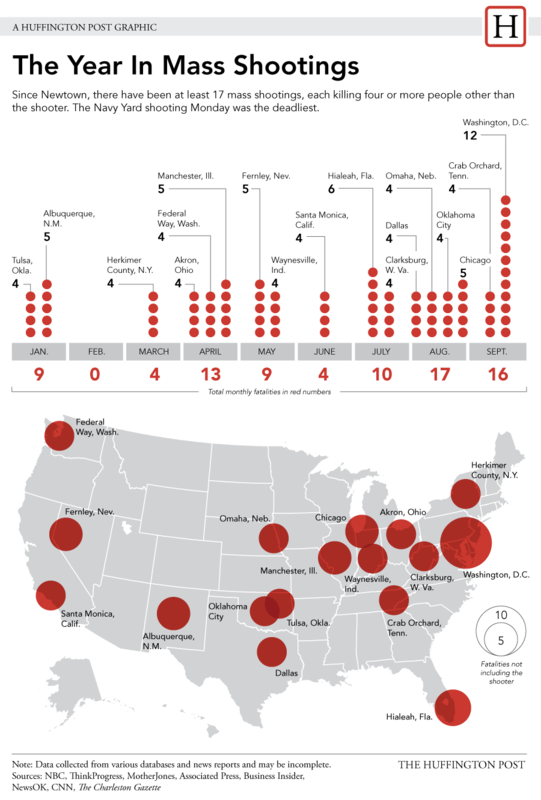 "Mass shootings are becoming as American as apple pie and baseball."